010. ROBERT F. SCOTT. Issued as a premium by Shell Oil in the UK (1972). It is an un-numbered card from a 20 card series entitled 'GREAT BRITONS'. Size: 5.2" x 3.6". 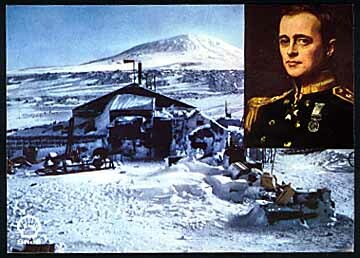 Recto: Portrait of Scott in naval uniform in upper right corner overlaid on view of Cape Evans hut and Mt Erebus behind.